1. Is this a site about Buddhism? Yes and no. The blog focuses heavily on Buddhist themes, such as kindness, compassion, mindfulness, selflessness, and non-attachment. However, you’ll also find posts about living out loud, finding your purpose, and pursuing your dreams. Tiny Buddha is a little bit Buddhism, but also a lot of wisdom from all religions, traditions, and cultures. 2. Who runs Tiny Buddha? I am also co-founder of the online course Recreate Your Life Story: Change the Script and Be the Hero. I have devoted over a decade to studying personal and spiritual growth, but my strongest credential for writing about wisdom is that I have hurt and healed repeatedly, just like you. In fact, I imagine I am a lot like Tiny Buddha readers: I want to make the most of every day. I want to challenge myself to be better, wiser, stronger, more self-aware, and more effective. I want to enjoy as many moments as I can. And I am human—which means some days are better and easier than others. 4. How do I submit a guest post? Anyone, of any age, in any location can submit their writing to the site. You can learn more here page. 5. Where can I get a Tiny Buddha shirt? You can get a Choose Peace, Be Here Now, or Just Breathe shirt (in sizes XL to 5x) on the Books & Things page. Unfortunately, I am a little behind with reading at the moment, so I’m not able to run books reviews or author interviews. Sharing a guest blog post may be a good way to introduce yourself and your work to Tiny Buddha readers. You can include links to your site/book in your bio. 7. Will you share my site/social media page/fundraising link on your site or social media pages? 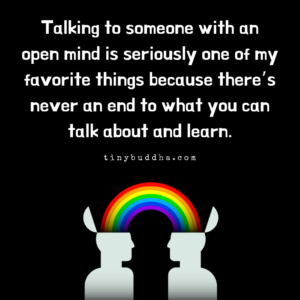 I’m grateful to know so many wonderful people working on amazing projects, online and off, and I love to introduce them to Tiny Buddha readers. The best way to do that is through the blog. In contributing a post, you’ll be able to promote your services and projects in your bio, reaching more than 100,000 email subscribers and more than three million monthly readers. If you’re looking to share a fundraising campaign with the community, you may want to share it in the Projects That Need Support section of the community forums. 8. Why was my comment deleted? I am a huge proponent of free speech, and I by no means want to limit the conversations these posts inspire. However, I take an active role in moderating this site to keep it a place that feels safe for open, authentic connecting. If your comment appears hostile or offensive to any of the writers or readers here, I will delete it. I also would appreciate if you minimized links in comments, particularly if you regularly link back to your own site. I frequently delete links that appear irrelevant to the conversation. Your user name will link back to you, so people will be able to learn more about you that way. 9. Will Tiny Buddha do a link exchange with my site? Tiny Buddha does not currently do any type of link exchanging with other sites. 10. How do I start a new thread in the community forums? First, choose a category here. Next, scroll to the bottom of the page. There, you’ll see an empty box to start a new thread. 11. Can I republish a post from tinybuddha.com on my blog? 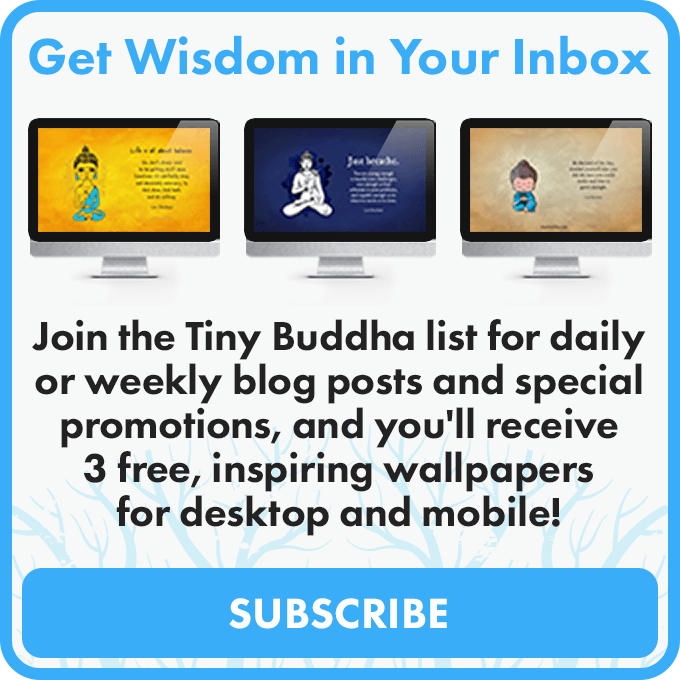 If you’d like to share a post from Tiny Buddha on your blog, you can feel free to do that so long as you include the author’s byline and bio, along with a note that reads, “This post was republished with permission from tinybuddha.com. You can find the original post here.” Please include links to both the homepage and the original post. If you would like to regularly republish posts (publishing more than five in total), I prefer that you publish a short excerpt for each one, ending with a link that directs readers to view the full post on Tiny Buddha. 12. Can I advertise on Tiny Buddha? Absolutely! Please contact me, Lori, at email @ tinybuddha.com for more information. 13. How can I receive updates from Tiny Buddha? 14. Can I email you for personal advice? I receive a lot of requests for advice, and recently I’ve been a tad overwhelmed by them. As mentioned above, you may want to set up a free Tiny Buddha account so that you can share your experiences in the community forums. It’s a really loving, supportive space, so I’m sure this could help. You may also want to check out the free resources page to find the help and support you need. If you can think of any other question that I should add to this page, please contact me at email @ tinybuddha.com to let me know. I appreciate your help!